Since I wasn’t blessed with long, gorgeous eyelashes, I’m no stranger to the eye-opening (literally) magic that is mascara. 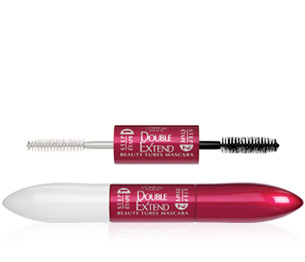 I’ve tried lots of brands over the years, but am particularly enamored with my latest purchase of L’Oreal Double Extend Beauty Tubes Mascara. So much so that I thought it was worth the D-Spot seal of Endorsement. It’s literally like liquid fake eyelashes, and it doesn’t smudge or flake. 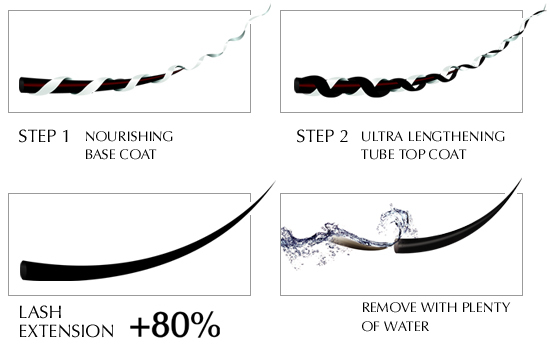 The white base coast lengthens and ‘builds’ up the lashes, and then you put on the black top coat. It takes a little bit to cover the white coat, but you’re left with very long, well-separated, lashes. The last mascara I bought, Maybelline Falsies (NOT endorsed), gave me length but also smudged and gave me 1pm racoon eyes! Not worth your money. You heard it here first. O, and the Beauty Tubes Mascara will set you back about 8-10 well-spent buckaroos. Despite the snow in the weekend forecast I decided it was time for a little Spring Cleaning. I went to Target to buy a cleaning caddy and lots of fun cleaning products to gear myself up for the big scrub down. Shopping makes everything better, plus I am determined to stop sucking at being an adult. 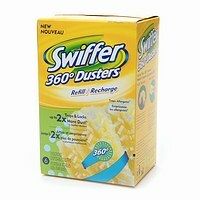 The bottom line is that I would like to know where Swiffer Dusters have been all my life. They pick up dust like no one’s business and I actually found myself a little sad when all was said and dusted. Yes people, they’re just that good. They’re about $4.50 for the starter kit (handle and three dusters) and about $8.50 for a 6 count refill pack. PS: You can find a coupon here. 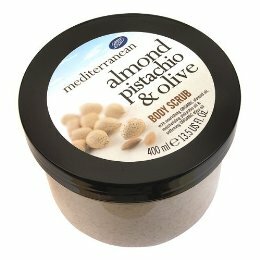 Time to share a little information about another product that is currently rocking my world: Boots Mediterranean Almond Pistachio & Olive Body Scrub. Sounds delicious, right? My love affair with Boots started during a trip to England when I was 15. Boots is to the UK what CVS is to the US, only like everything in the UK it’s much more posh 🙂 The packaging, the scents, the blends…it was love at first sight. Fast forward to college and when NYCathy came home from studying abroad in Ireland, she was sure to pick me up some Boots products during a visit to the UK. Fast forward again to about 3 or so years ago, and Boots products finally took a trip across the pond and are now sold in the US! O HAPPY DAY! But back to the body scrub. It smells amazing, feels amazing and leaves your skin so soft that after-shower-lotion is deemed useless. Of course the best part is that this fabulous line of products won’t break the bank. You can find Boots at Target for a steal. This 13.5 oz tub of scrubby amazingness only costs around $10. Scrub happy! This product was love at first smell. Honestly, if you’re like me and have ever dreamed of dunking your entire head into a pool of mint chocolate chip ice cream (don’t judge) than you will LOVE Organix Hydrating Teatree Mint Shampoo & Conditioner. 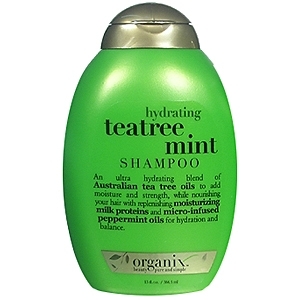 Organix describes it like this: An ultra hydrating blend of Australian tea tree oils to add moisture and strength, while nourishing your hair with replenishing moisturizing milk proteins and micro-infused peppermint oils for hydration and balance. Re-energize your hair with this unique blend of organic active ingredients, creating a three-in-one decadent treat. All you need for moist, smooth and seductive hair in one irresistible formula. Sounds fancy, right? Well the best part is you can pick up these products at your drugstore of choice – CVS, RiteAid, Wallgreens if you’re feeling crazy. Last time I purchased this product it was 2/$5. Now, with poker straight hair, I’m not super-picky about my shampoos, but I do feel like this product leaves my hair clean and hydrated. But it’s the smell alone that gets this Endorsed. I’ve been wanting to start a little blog feature for time now, and so without further ado, I give you Endorsed. I told you here about what a product fein I am, so I thought it would be fun to start sharing with you some of the products/things I love…and also some of the products/things I’ve tried but wouldn’t buy again. So the first D-Endorsement goes to Clinique Moisture Surge face lotion. 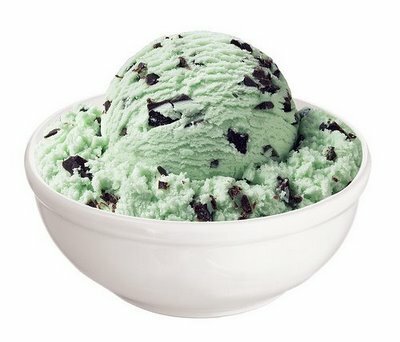 It’s the BEST at beating the inevitable ‘dry winter skin’ blues. The lotion’s gel-cream texture feels cool, has a super light texture that absorbs quickly and doesn’t leave you feeling greasy. I also have pretty sensitive skin and this moisturizer has never given me any problems. Best part is that a little bit goes a long way, which is good because in terms of the products I usually buy, this one is a tad pricey. A small jar will set you back $34, with the bigger one coming in at $46. I would have to say it’s worth every penny though. 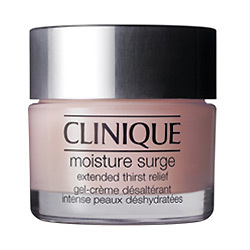 Clinique Moisture Surge lotion, consider yourself Endorsed!